Russian jewelry manufacturers see gold not just as a costly raw material, but also as a valuable finished product. During the Soviet era, 25 jewelry manufacturers met the demand of the entire country for precious stones and metals. Today, there are more than 4,500 jewelry makers in Russia, employing some 150,000 people in one of the country’s most high-tech sectors. From 2001 to the beginning of the global financial crisis, the jewelry industry in Russia showed stable growth, efficiently combining long-established traditions and reliable sources of raw materials. The industry reported an average 30 percent annual growth rate for most of the 2000s. In 2011, Russia ranked fifth in the world in the production of gold jewelry and 12th in that of gemstone pieces. Nevertheless the past two years have been difficult ones for the Russian jewelry sector. Prices for precious stones and metals have increased dramatically. 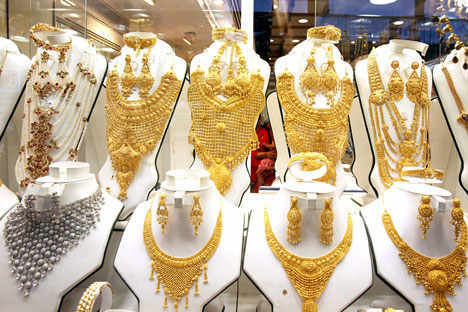 Gold prices rose from $1,000 per ounce to $1,800 and diamond prices from $66 to $124 per carat. This increase in costs combined with an overall reduction in disposable income for ordinary Russians has forced major manufacturers to cut costs. Overall jewelry production is down 30 percent, and the average weight of items sold has been reduced from 3.7 grams to 1.4 grams, a result of the shift in consumer demand towards cheaper items. These factors are common for jewelry producers across the industry, but other issues are specific to the Russian market. According to Farit Gumirov, general director of the Almaz-Holding jewelry company, one factor impeding the development of the domestic jewelry sector is the Russian taxation system. Importers of raw materials, including gold, precious stones and high-tech equipment have to pay high customs duties, a profit tax and the value-added tax (VAT) in order to bring goods into Russia. Although this tax is later refunded, it takes needed capital away from production. Additionally, all finished items must be securely transported to an assessment office so they can receive a special government stamp. Providing both the security and the transportation increases costs that then must be added into the price of the product, which makes Russian-made jewelry uncompetitive with foreign-made items. An additional problem is the increasing amount of inexpensive foreign jewelry coming into the Russian market. Experts believe that imports from countries such as China, Thailand, India and Turkey now account for about 35 percent of all jewelry sold in Russia. Given the low manufacturing costs in those countries, even assuming the price of the imported items is tripled by customs duties, they are cheaper than Russian-made pieces. Russia’s accession to the WTO and the subsequent reduction in customs fees will further decrease the competitiveness of Russian products. To minimize their losses, Russian producers are now signing contracts with companies in Southeast Asia to export Russian raw materials to Asian factories for the creation of pieces that later return to Russia as finished jewelry. Russian jewelry makers have also proposed a set of measures to increase the competitiveness of Russian products on the domestic market, including the cancellation of import taxes on precious stones and the abolition of the VAT on the sale of precious metals in ingots. In addition, in order to prevent illegal jewelry imports and level the playing field for Russian manufacturers, the Russian Association of Jewelers has proposed a special stamp for imported jewelry, which will be required for the sale of items in Russia. A new facility in Kazan is capable of producing artificial diamonds and gemstones that can pass even the most thorough examination. Scientists there have learned how to use an ion beam accelerator to inject ion chromophores into the matrix of quartz or beryl, effectively turning these cheap minerals into sapphires, emeralds or rubies. Unlike synthetic gemstones, which only share a color with an actual gemstone, these stones possess the same chemical and physical characteristics as the real thing.